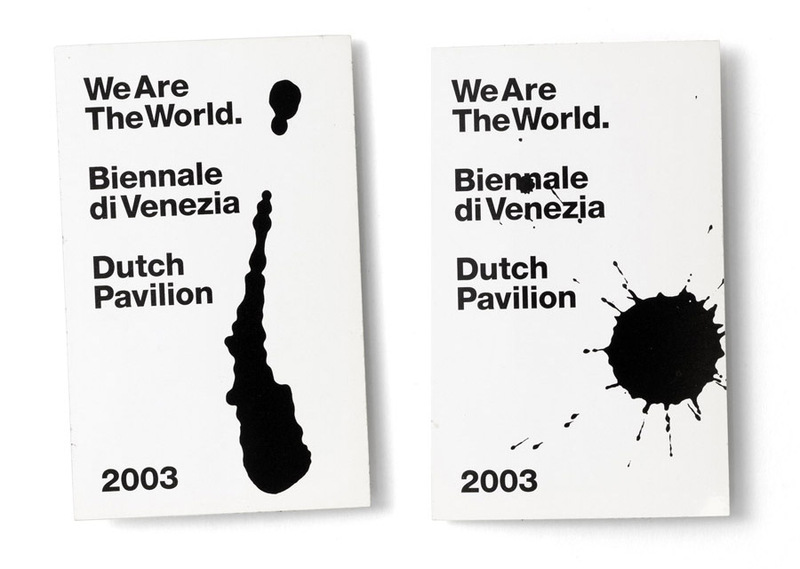 ‘We Are The World’ was the group exhibition that took place at the Dutch pavilion, during the Venice Biennale (the Biennale di Venezia) of 2003. 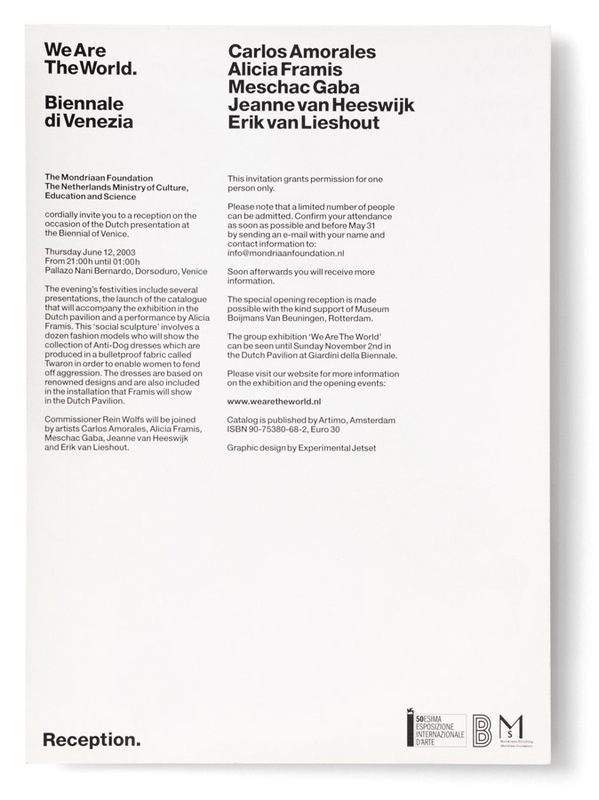 The main item we designed for this biennial was the catalogue, which we already described and photographed a while ago – the full story can be read here. The chapter you are reading right now is much more recent, and describes all the other printed matter we designed for this project: invitations, cards, a newspaper, some badges, etc. 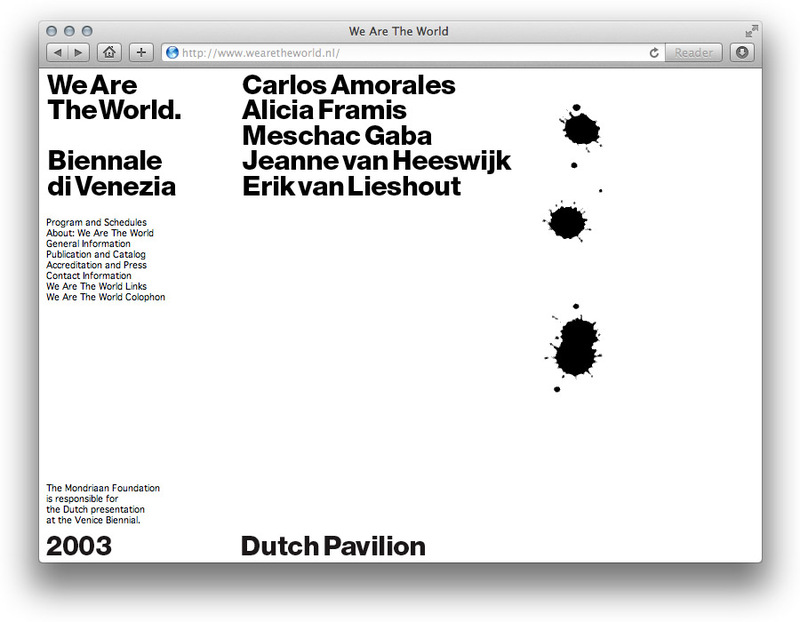 As we already described (in much more detail) in the previous chapter, the curator of ‘We Are The World’ was Rein Wolfs, and the participating artists were (in alphabetical order) Carlos Amorales, Alicia Framis, Meschac Gaba, Jeanne van Heeswijk and Erik van Lieshout. 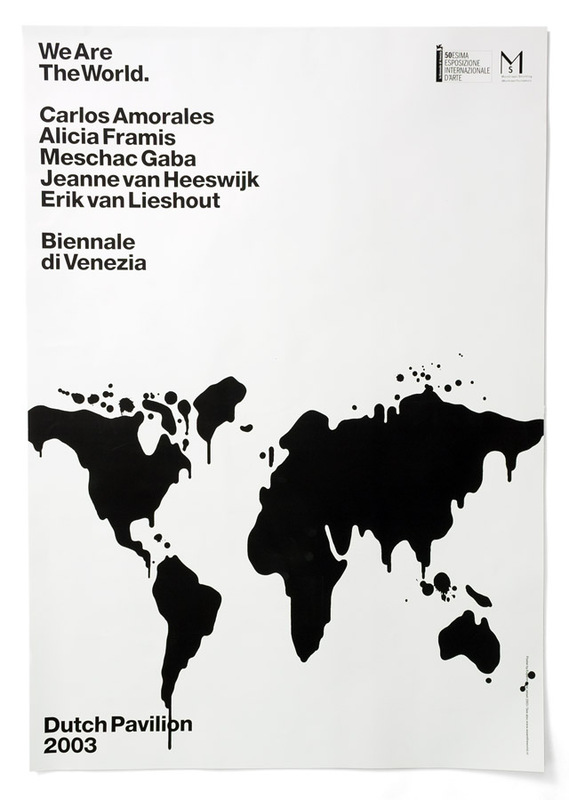 Rein Wolfs also proposed the title, ‘We Are The World’, as it was his intention to turn this exhibition into a clear and optimistic statement about the state of ‘multi-culturalism’ in the Netherlands today. 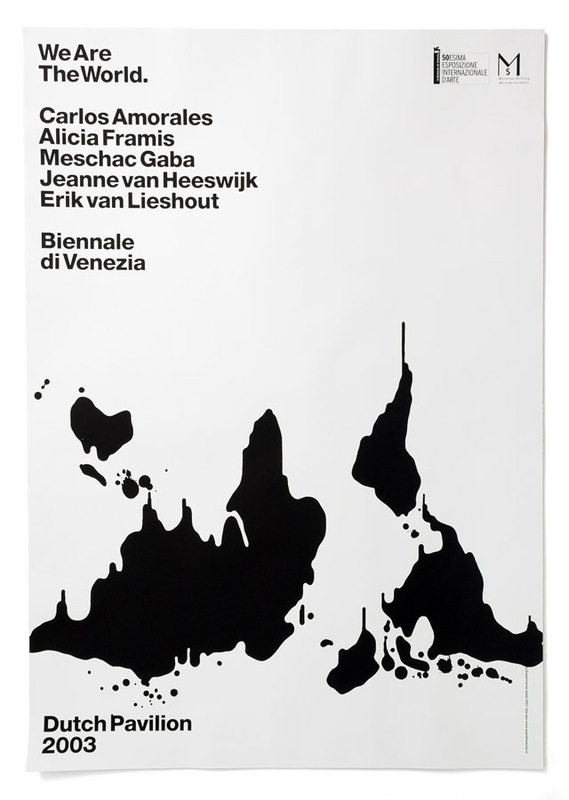 In fact, of the five chosen artists, only two (Jeanne van Heeswijk and Erik van Lieshout) were born in the Netherlands; the other artists were born in Mexico (Carlos Amorales), Spain (Alicia Framis) and Benin (Meschac Gaba). The exhibition intended to juxtapose different notions of cultural diversity, politics and art. 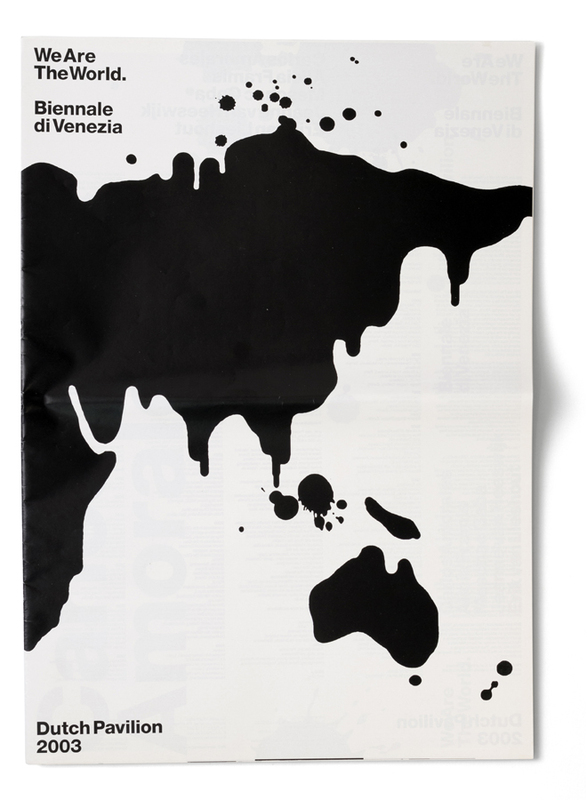 To address the theme of national identity, we decided to come up with a graphic system consisting of simple inkblots. 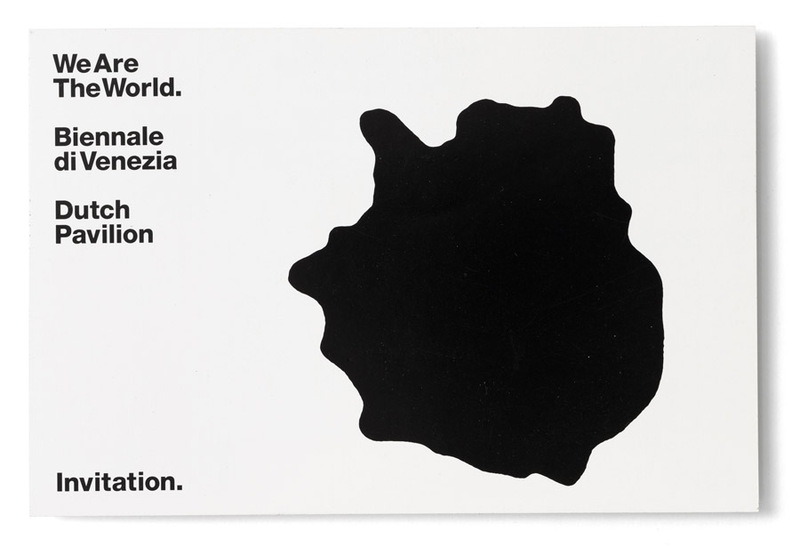 To us, these inkblots referred to the shape of countries and continents, to Rorschach tests, and to the drips and stains of painting (the archetypical mode of art). The whole idea was to somehow suggest that national identity is most of all a psychological construction. The sign system we designed for this exhibition turned out to be pretty minimal; after all, the space wasn’t that big. Just some titles for the interior of the pavilion, and some lettering for the exterior. Shown below is a picture of the outside of the pavilion, and a picture of some banners that were used during the opening of the exhibition (taking place on a separate location). [Update: pictures not available yet, but hopefully we will be able to add them soon]. And as we already wrote – for a general introduction to the concept behind ‘We Are The World’ as a whole, see WATW / Catalogue. 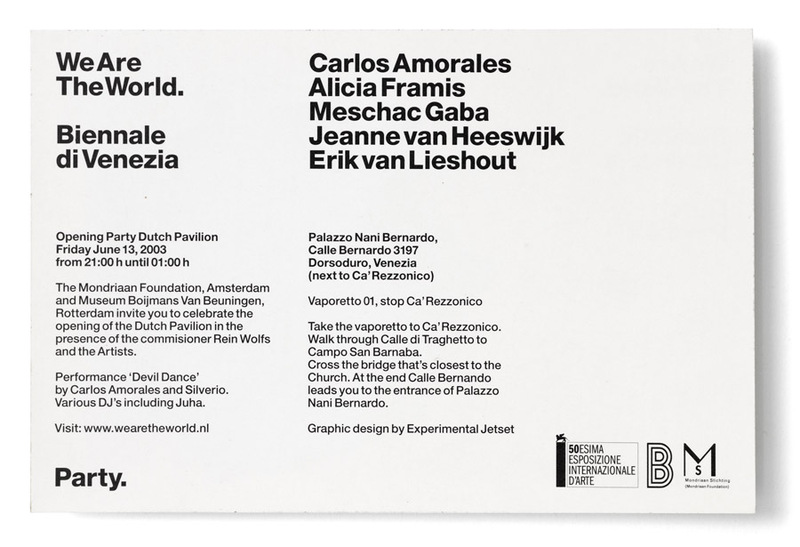 A second edition of ‘We Are The World’ took place in March 2004, at the Rotterdam museum Boijmans van Beuningen. More information about that exhibition can be found here. As a final update, we should mention the catalogue we designed for WATW received quite an interesting afterlife. 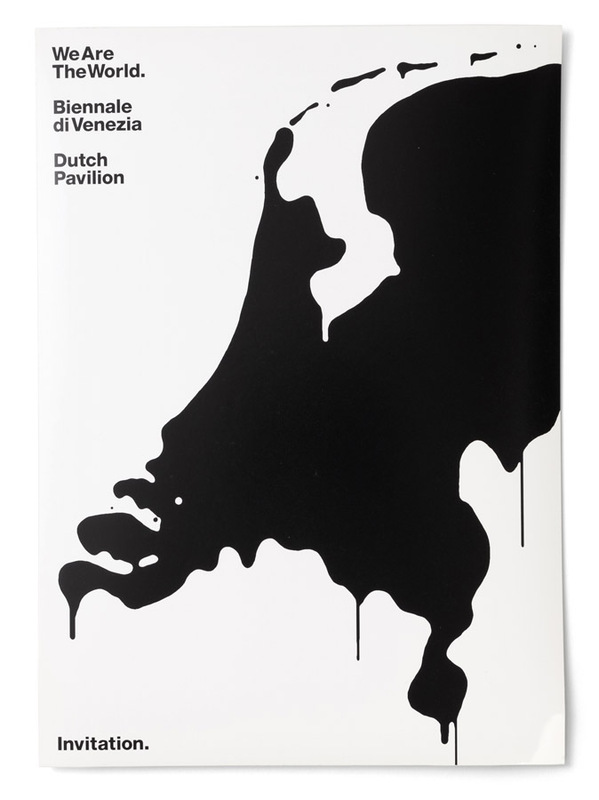 In 2004, Irma Boom used the image of ‘the dripping Netherlands’ on the front of ‘False Flat’, a book she designed for Phaidon (obviously, she used the image with our permission, and we were also mentioned in the credits). 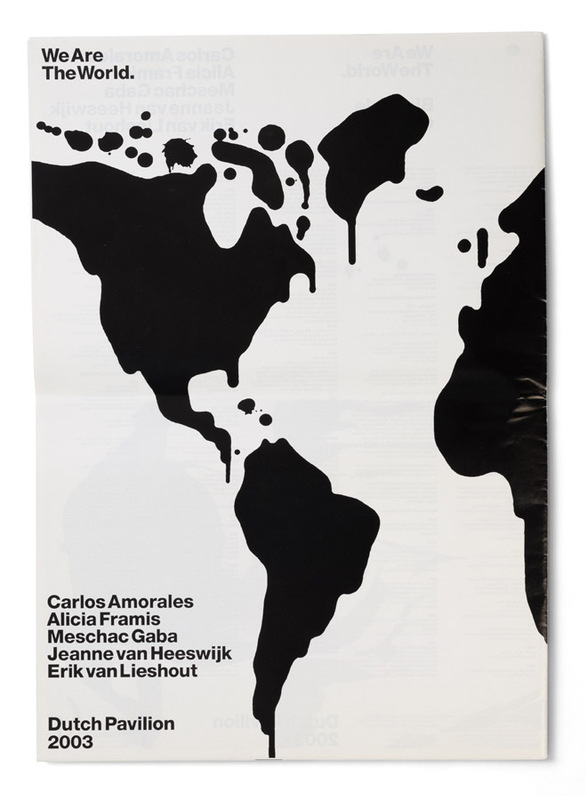 A couple of years later, designer Harmen Liemburg used the image as part of ‘Dutch Flood’, a screenprint he produced for MCAD. And in 2008, Dutch stand-up comedian Theo Maassen used the 'dripping Netherlands' image quite extensively in ‘Zonder Pardon’, his theatre tour of 2008/2009. Maassen used the image on his tour-poster, and in the set-design (as a huge backdrop), and in the DVD-titles (again, this was done with our full permission, and we were mentioned in the credits). 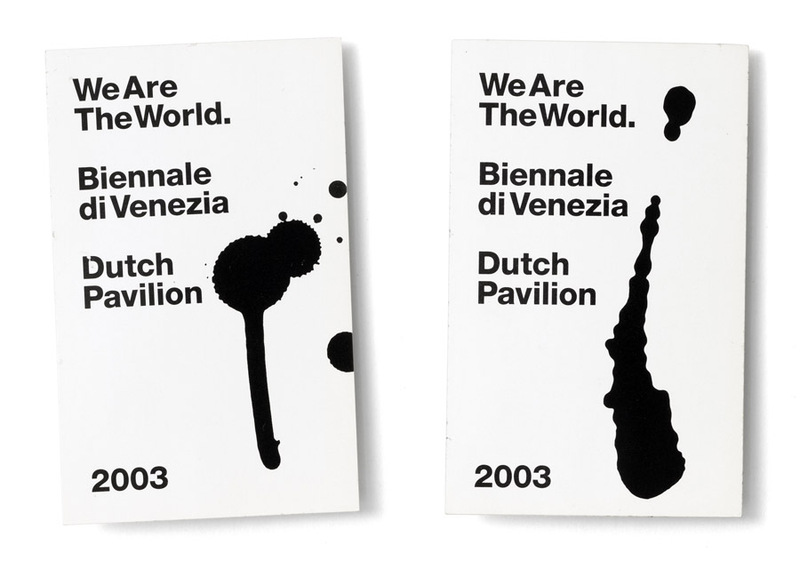 All material printed by Drukkerij robstolk (r), except for the A0-posters which were screenprinted by Henderson/Wyber Amsterdam, and the badges which we printed ourselves.